The model Robotex IMP.A.C. 126 A is a fully automatic palletiser and includes motorised conveying systems for handling empty and filled pallets. It is a compact machine suitable for fully automatic production lines up to 500 bags/h. The key component is the plier, which picks up the packet. It is designed to completely enfold the packet, making it possible to handle floppy bags, or bags filled with fluidised products. The pliers also incorporate an integral bag-flattening device. Each incoming bag is pressed and transferred to a pick-up position. The pliers then picks up the packet, orientates it and presses it onto the pallet in accordance with the preset program. This cycle is repeated for each bag until the pallet is filled. The filled pallet is then automatically moved to a holding conveyor, and an empty pallet is automatically transferred to the loading position. The Cartesian movement and positioning of the pliers is controlled by digital encoders, and the vertical movement is controlled by an air cylinder. 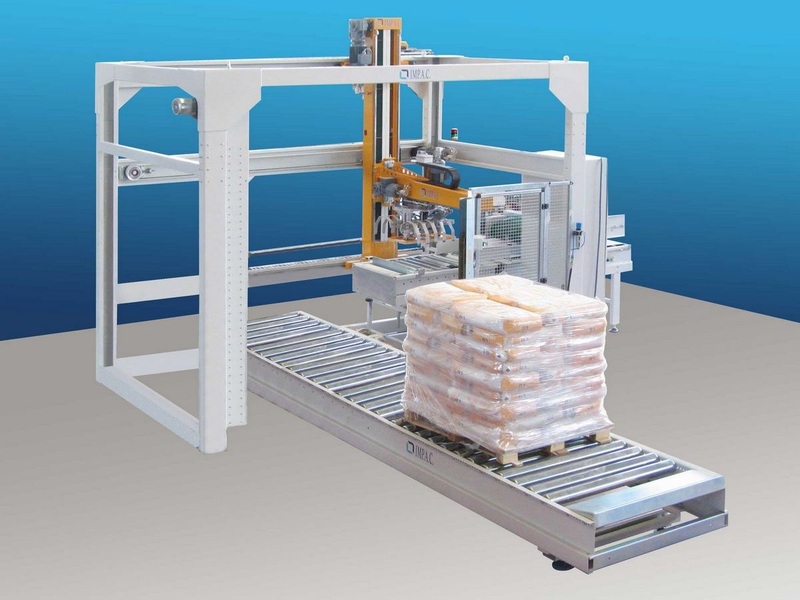 The palletising operation is controlled by a PLC, which can be programmed to handle bags of different dimensions, formations and number of layers.